We are going to set up a DNS failover using Master/Slave configuration and configure dynamic updates. Do automatic rndc configuration, and use an authentication key of 512 bits. Note that the default key name is rndc-key. The content of the master configuration file /etc/named.conf can be seen below. Note how the internal zone updates are only allowed for the servers that know the key. Ensure that file ownership is sane and SELinux file context applied. hl.local. 86400	IN	NS	dns2.hl.local. hl.local. 86400	IN	NS	dns1.hl.local. The content of the slave configuration file /etc/named.conf can be seen below. Dynamic DNS editor, nsupdate, is used to make edits on a dynamic DNS without the need to edit zone files and restart the DNS server. Because we have declared a zone dynamic, this is the way that we should be making edits. This entry was posted in DNS, High Availability, Linux and tagged BIND, CentOS, failover, homelab, nsupdate, rndc. Bookmark the permalink. If you notice any errors, please contact us. Thanks for the great guide! I have a question though. If so, is there any configuring involved to only let the service be active for a particular interface? All servers have one NIC and are one the same LAN 10.11.1.0/24. If you have multiple NICs and multiple IPs, then you can bind services on specific IPs that you need them listening on. I’m asking because I’m using my own computer with virt-manager and thus using a virtual network. Should I just create a virtual (isolated) network and put all the servers in there? Or, coming back to the first question, give them each 2 nics, one NAT for internet access and one for the 10.11.1.0 LAN? 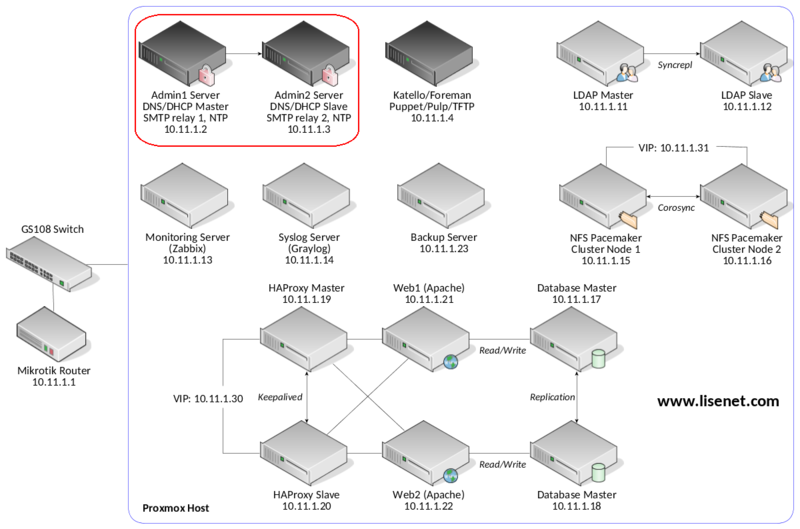 I have some KVM hosts that I manage with virt-manager/virsh, but they all are on a bridged network (standard libvirt installation provides NAT based connectivity – I don’t use that). I’m not sure I understand what you want to achieve here. You can use 2 NICs if you want to, and then you can bind services to specific IPs if you want them isolated. If I just bridge those to my home network, wouldn’t I get issues with the DHCP service colliding on my home router and the one I’m configuring here? You can have more than one DHCP server issuing the same range of network addresses out to your clients. When a client broadcasts a discovery request, the first DHCP server to respond with an IP offer is used. Your home router will have a pool of addresses that it can issue to clients. If you have more than one DHCP server offering addresses to the same subnet, then they should have different IP pools (or ranges) that don’t overlap, e.g. 10.11.1.40-10.11.1.59 and 10.11.1.60-10.11.1.90. Sorry for the late response. Only now found the time to continue this project. I understand now and will go ahead to try this. Thank you for the help!